Hotshot carrier, 3500 Ram Dually with 2 gooseneck trailers (24ft BigTex 14ET Utility trailer, 43ft Kaufman 3 car hauler). Insured. TWIC. We transport throughout FL,MS,AL,TN,GA,SC,NC,VA, MD and PA. I'm an Owner Operator of 13 years. I operate an F450 dually witha gooseneck trailer and I'm based out of San Antonio, Texas. I transport with honesty integrity an more with safety as my focus. I'm extremely reliable, professional and dependable. Open communication is a must, from the beginning to the end of shipment. I haul just about anything you need shipped. I'm very punctual with no excuses and committed to getting shipment complete. I carry 200,000 in cargo insurance and transport in 48 states. I'm very responsible an transport with pride in handling your shipment with care. We build round pen covers for the horse industry and ship them nationwide. Requires a 28ft flatbed trailer as the trusses are 28ft long. wt. 5,000lbs. East Cost Transport LLC provides unlimited resources to move your freight. We can provide the fleet to meet your needs, including Truck Load (flatbeds, dry vans, reefers, tanks or Intermodal). We can work with you on one load or a dedicated fleet. Our McLEOD TMS freight brokerage management software ensures almost unlimited options for our customers and full accountability. This enables us to meet deadlines on time with customized operations. Our MACROPOINT tracking keeps our customers informed about where their trucks are, and integrates with our TMS, providing fast and reliable pick up and delivery, as well as tracing and temperature monitoring. We also use Electronic Data Interchange to facilitate communication with between our customers, operations and accounting, if customers desire this optional service. Express delivery from B 2 B from 24' Box trucks to Hot Shots, we get the job done. 50' wedge trailer, 3500 Dodge dually is the current equipment. Hard work, Faith and Family is what we are built on. Available anytime. Emerson Transport, LLC is located in South Central, Kentucky. I have a new 2017 Ford F-250 with a new 25+5 Dove-tail trailer. I am fully insured with $100K cargo and $1 Million Liability. I carry straps, binders and chains. I will deliver to all southern states, mid-west and some eastern states I can haul up to 11,900 lbs. I have seven (7) years experience driving a semi with my CDL being current. I take great pride in professional and courteous service and look forward to hauling for you. Please call Joe at (606) 305-5839. Towing company with a 21ft tilt/flatbed truck that can haul 15K on the deck. Looking for freight to supplement our towing business. We are a small Female owned company. Can haul autos, boats etc. Also have the equipment to haul skids. Looking for freight primarily in the Eastern IA, Northwest IL, and Southwest WI areas. Very reasonable rates. Give us a Call. I'm the Owner/Operator of this Hotshot Trucking Business. I operate a well maintained 2012-DODGE Ram 5500-Dully; with a 12ft. 6,000 lbs. capacity Flatbed. I'm a current TWIC-Card holder and experienced in Customer Support and Service. We will haul your equipment both locally, & Out of State. I pride myself in On-Time Delivery and Professionalism. Contact Ronnie J. Trahan Jr.
Hotshot available based out of Florida. I have a 40ft gooseneck trailer and can load up to 20,0000 lbs. Looking for loads in lower 48 states. We have two trucks in our Fleet both Dodge Ram 3500 and two removable goosenecks a 32 foot and a 30 foot. If you need something moved for a reasonable price and you need it moved quick give us a call. Independent shippers, based out of New Mexico, Colorado & Nevada. We transport with integrity, honesty & more with safety as our focus. We are extremely reliable, professional & dependable. Open communication is a must, from the beginning to end of your shipment. We can haul just about anything you need shipped. We are punctual with no excuses & committed to getting the shipment complete. Most direct hauls take up to 2 or less days to deliver & sometimes more if needed. If we say we will be there at a certain time, guarantee we will be there. We carry $75,000 cargo insurance & transport in 48 states. We have provided shipments for many dealerships & factory's. Transporting LTL,FTL, Heavy Equipment (Chain Loads), Towaways, RVs, Horsetrailers/trailers & Vehicles. We ship in two trucks, a 2016 Ram 3500 MegaCab Dually & a 2013 Chevy 3500 Dually. So hauling heavy is not a problem. We are responsible & transport with pride in handling your shipment with care. Give JLo Hotshot a try! I have a 3500 Dodge Dually thats pulling 2017 35+5 dovetail. Looking to haul around San Antonio and all surrounding areas. I have 3 years hauling experience in the oilfields. Dispatch Service with 9 years experience dispatching hotshots, flatbed, stepdecks, dry vans, and reefers. You drive while I prospect top paying loads in addition to handling the rest of your administrative overhead such as negotiating rates, handling necessary paperwork and billing. No need to face the frustrations of being stuck at truckstops, searching load boards, calling brokers with cheap freight, waiting for emails & call backs, and paying for copies and faxes. We have hotshots available and tractor trailers available too. We are a very small hot shot company located in Alabama. This is our first time to visit a website for finding loads. We have a 20ft.flatbed trailer and a 40 ft flatbed trailer with a goose neck, dovetail and ramps. Veteran owned dispatch company. Looking to dispatch for 2 to 5 O/O Carriers. We can dispatch for 18 wheelers, Hotshot Rigs, Cargo trucks, Cargo and Sprinter Vans just to name a few, we have over two years dispatching experience and several years driving a Hotshot Rig. We use a 2016 40ft gooseneck trailer W/ Air Ride suspension and an 8ft cargo deck on top of gooseneck for a total of 48ft of useable deck space and Monster Ramps. We can carry up to 16K and we use heavy duty tarps with 8ft drops. Our equipment is well maintained and clean. Driver is a US Citizen and has TWIC card. Clean background and has held security clearances up to TOP Secrect(currently inactive). We do not have HAZMAT capability at this time. We can run the lower 48 and look forward to supporting your shipping needs. We are a LTL carrier. I would like the opportunity to help you in moving your freight. I have five (5) 26'ft straight box trucks with a heavy-duty lift gate for each truck. We move local NJ-NJ, local NY and PA.
We are a company that buys/sells used industrial equipment. We ship forklifts all over the states (LTL and Full truck loads). Based out of Council Bluffs, IA, we are always looking for V/FB/SD/RGN type trailers! We also have inbound freight from all over the states too! So if you are looking for a partial or full load that will be going through/coming to Council Bluffs, IA... give us a call! Please call anytime during the week if you have a truck passing through and we'll see what we have going! My name is Felipe Salinas. I have a 40' gooseneck with dovetail, 102 wide, not deck height. I'm dependable and will get your cargo there safely and quickly. We are a small company looking for daily hot shots loads and to establish long term relationships. We have a 2016 Ford F350 with a 40 foot trailer with a 25,000lb weight capacity. We are licensed, insured. Active DOT and MC authority. We are based in Lexington, Kentucky. Our driver has 20 years of CDL driving experience. He has an excellent driving record. Please give us a call for all your shipping needs. We are a Hot Shot company out of Conroe, Texas. We have straight trucks, flatbeds/stakebeds and cargo vans up to 14' in length than carry up to 5,000 lbs. We prefer to pick-up within 150 mi of Houston/Conroe, but can deliver anywhere in the lower 48. We are US DOT certified with authority for the 48 contiguous states. We dispatch for Hotshots, 48' Flatbeds, 53' Dry Vans, Power onlys, and Reefers that are willing to follow the money and stay OTR for 2-3 weeks at a time. As of right now we don't dispatch for box trucks or sprinter vans. 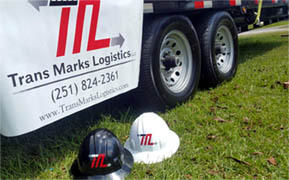 Trans Marks Logistics LLC is an independent owner-operated quick run trucking and express courier service company. We are based in Mobile, Alabama and provide services to forty-eight states throughout the continental United States . Our common loads are considered LTL (less then truckload) and include construction, oil field, farm, and industrial equipment; although we have the ability to haul just about anything. Try our EXPEDITED FREIGHT SERVICES Trans Marks Logistics LLC have the expertise, equipment and staff to safely transport your expedited LTL (Less-Than-Truckload) freight, while meeting rigorous deadlines. Our operations have the capacity to expedite light to heavy shipments and delivery schedule via dedicated transportation 24 hours a day, 365 days a year with same day delivery. Boxhub.co is the leading global market platform for new and used container sales. We require regular deliveries of empt 20ft, 40ft and 45ft shipping containers/ conex boxes from ports and container depots across the US. Boxhub.co is developing the most transparent marketplace for buying new and used shipping containers across the US. As part of this, we are now expanding our network of delivery partners. We are looking for top-professional partners that can deliver consistently at fixed, competitive prices in local areas. So, if you are able to deliver 20ft, 40ft and/or 45ft empty shipping containers, please reach out to discuss a partnership. We will help you increase utilization of your trucks. We look forward to hearing from you, and start sending you new clients. Professional Intrastate Company serving all of Florida. We run a 2016 ram 3500 with a 40ft flatbed Big Tex Trailer able to carry up to 20,000 lb. Have been hauling safely and dependably across America for over 30 years- Compliant with all Regulations. We are here to handle all your shipping needs with quality new equipment and experienced drivers to make deliveries safe and on time. We been in business for about 10years safe and accident free. We have 40ft. Flatbed gooseneck trailers ready to haul and transport at anytime. Let us haul your next load and ones also in the future. I use a 2008 Chevrolet Silverado 2500HD 6.6 duramax. I can haul up to 15,000 pounds with a 36ft gooseneck trailer. I only haul in southern states. We run a 2017 Ram 5500 with a 35 ft and a 40 ft flatbeds. We can handle 18000 Lbs of any type of freight . WE are veterans serving the trucking industry. We are fully insured and industry compliant for your peace of mind. Call Mike at 727 309 6624 We operate out of Ocala Fl.and serve the whole state of Fl. I have a 40 foot flatbed gooseneck Gatormade trailer for sale. '17 Ram 3500 - 40 ft flatbed transporting autos and general freight B2B or Door2Door. Compliant with all State and Federal regulations. Professional service and well maintained equipment is a requirement. 2017 F450, 40' Gooseneck MaxxD air ride equipped trailer. We are a hotshot company with a 40ft gooseneck and 2013 Ford F-350 ready to go all 48 states. US DOT 3072255 with full coverage insurance 1,000,000 liability and 100,000. Cargo. We are 24 hour availability for hotshot Freight service. Serving local and long haul needs. We have 17 years of experience driving all over the USA!!!! !